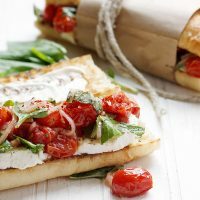 This Blistered Tomato Caprese Sandwich feature lovely cherry tomatoes, charred and served with fresh mozzarella, basil, shallots and mustard mayo, all on a beautiful grilled baguette. You can do the whole thing on your BBQ! 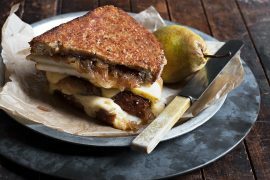 All this week I’m sharing sandwich recipes, because sandwiches are a great way to enjoy the Summer’s bounty of fresh produce. They’re also great for a simple, oven-free supper when the heat is high and cooking energy is low. 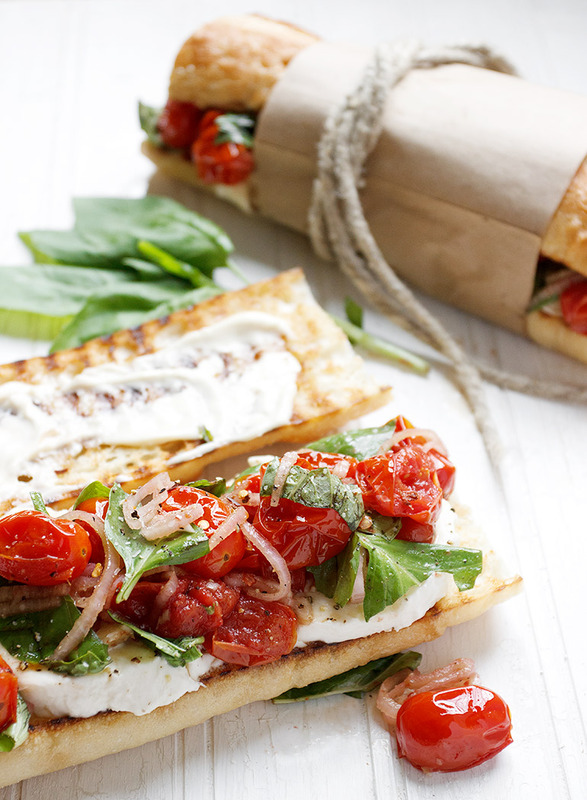 This Blistered Tomato Caprese Sandwich fits that bill perfectly. I need to start out my description of this sandwich by saying … it’s really, really delicious and you should make it :) Ok, beyond that, this sandwich has lovely cherry tomatoes, cooked up in a skillet over high heat until they blister. It’s then mixed with shallots and garlic in a bit of red wine vinegar, then served on beautiful grilled bread with a mustard mayo and lots of fresh basil. 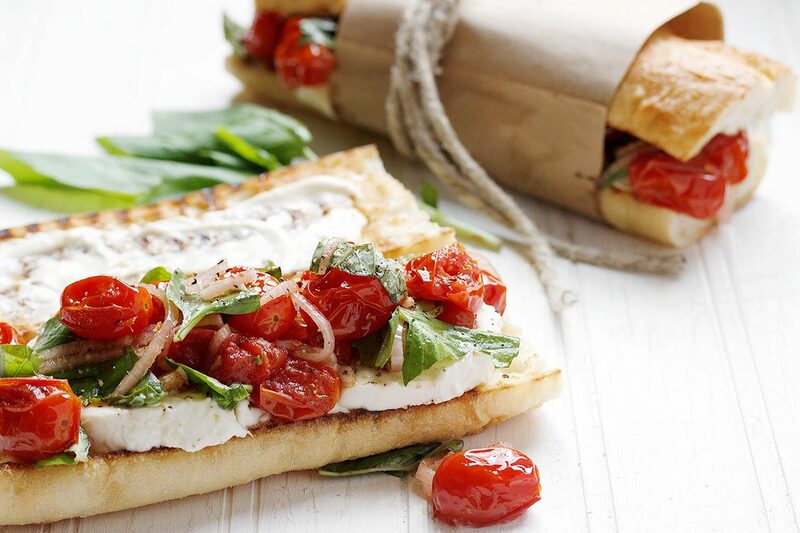 It’s caprese salad on bread and it’s seriously delicious. I mentioned above that you can make this whole sandwich on the BBQ. Use it for grilling the bread, then pop your cast iron skillet right on the BBQ to blister the tomatoes (you can also do this on the stove-top, of course). The addition of red wine vinegar to the shallots and then quickly tossed with the hot tomatoes, make for really rich and delicious flavour combination. That might have been my favourite part of this sandwich – that and the way all the flavours migrated in to the bread a bit. You can serve this sandwich as a regular sandwich, which is not as messy to eat as you may think or you can serve this open-faced to be eaten with a knife and fork. I loved the heartiness of the regular sandwich and the way the juices from the tomatoes and other flavours migrated in to the bread from being sandwiched together. For entertaining though, open-faced is probably the way to go. Use a really great baguette, the best you can find. It really does make a difference. Be sure to season each element with salt and pepper as you go along to really bring out the flavours. To prevent the torn basil leaves from turning black, be sure to allow the tomatoes to cool slightly before adding the basil. 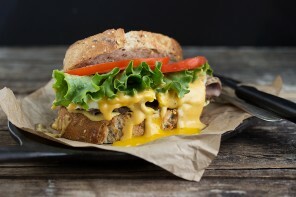 Prepare the mustard mayo by combining all the ingredients and stirring until well combined and smooth. Set aside. Place the shallots and garlic in a small bowl and add red wine vinegar. Stir to moisten then set aside. Cut baguette in half lengthwise and brush the cut side with olive oil. Grill over medium-high heat until golden and lightly charred. Season with salt and pepper. Set aside. Place cast-iron skillet on BBQ grill or on stove-top over medium-high heat. Add 2 Tbsp. olive oil, then add tomatoes and cook, shaking the pan often to rotate the tomatoes, until they are blistered and lightly charred, about 4-5 minutes. Add tomatoes to a large bowl, then pour reserved shallot/vinegar mixture over-top. Stir to combine, then set aside to cool a bit. If making a standard sandwich, spread mayo on one piece of the grilled bread. 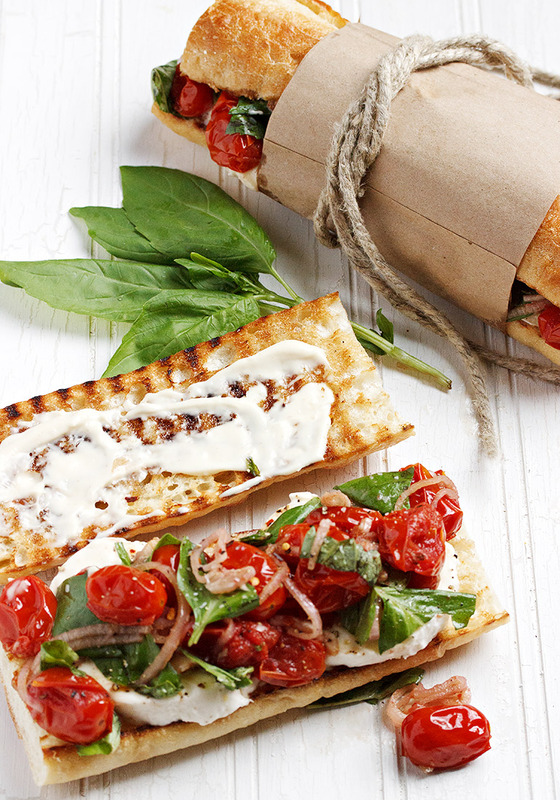 On the other piece of bread, place cut or torn fresh mozzarella. Sprinkle with salt, pepper and a pinch of crushed red pepper flakes. Add torn basil to slightly cooled tomatoes, season with salt, pepper and a pinch of crushed red pepper flakes and stir gently to combine. Using a slotted spoon (to leave the liquid in the bowl behind), spoon tomatoes with shallots over mozzarella. Top with other piece of grilled bread, then cut in to smaller serving pieces. For open-faced sandwiches, prepare as above, but spread mayo on both pieces of bread and top each with mozzarella and tomatoes. Well I’m totally down with sammie week if this is the type of sandos you are doling out! I love caprese any which way I can get it, but shoved into some crunchy bread?! YES PLEASE! Plus those blistered tomatoes are totally calling my name! So GOOD! Cheers, Jennifer! Thanks Cheyanne :) The tomatoes are delicious! Thanks Laura :) It was super delicious! I am loving everything caprese right now, I’ll be so sad when the summer tomatoes go out of season. This sandwich looks fabulous! 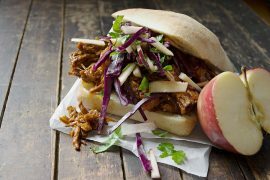 A summer sandwich doesn’t get any better than this one Jennifer! I’m with Sarah! Mmmmmmmmmm!! I couldn’t resist, Sarah ;) It’s one of those recipes that looks so simple, but the end result is definitely greater than the sum of it’s parts!